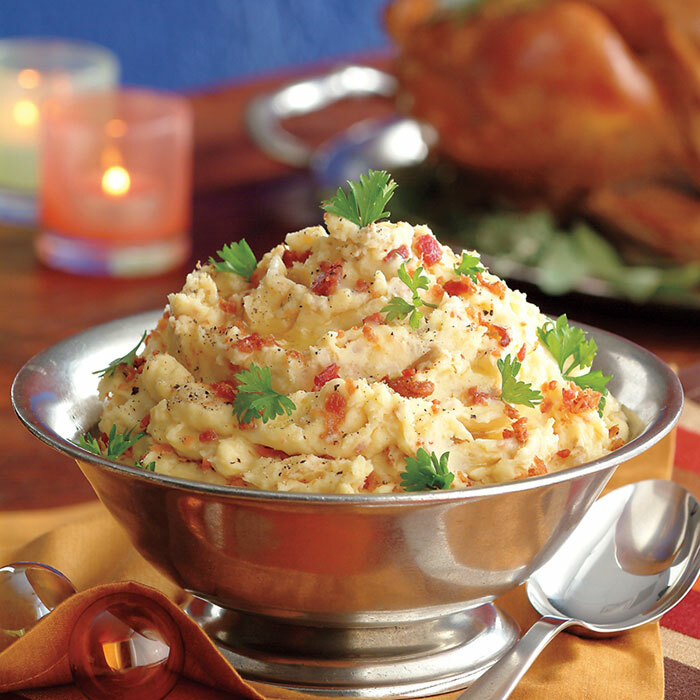 Add bacon and cheddar to your mashed potatoes for a delicious, decadent twist on a comfort food classic! In large covered saucepot, add potatoes and enough salted water to cover; heat to boiling over high heat. Simmer, uncovered, 15 minutes or until potatoes are fork-tender. Drain potatoes well, then return to saucepot. Add sour cream, butter, salt and pepper. With hand mixer at medium-low speed, beat potatoes 2 to 3 minutes or until light and ﬂuﬀy and few lumps remain; do not over mix. Fold in cheese and bacon. Garnish with parsley, if desired.